Of all the things that have changed in the game of football over the years, this particular adage seems to have stood the test of time. Folks, that’s exactly why I’m so excited for this upcoming season. For the first time in a long time, we can confidently say that our defense is going to be elite. Our improvement on that side of the ball last season was a welcome sight for sore eyes, but it was just a taste of what’s to come. In 2018, I expect us to take a webfoot-sized leap forward and become one of the top defenses in all of college football. It takes the perfect combination of talent, coaching and ideal circumstances for a defense to realize its full potential, and this season, our defense has all of the ingredients necessary to be dominant. Need some convincing? Let’s examine the evidence. So, what makes a great defense? Well, if you ask people in the NFL, they’ll tell you that it starts with having talent at the premium positions. Jalen Jelks is one of the top pass rushers in all of college football entering 2018. Although football is branded as the ultimate team sport, each position is valued differently. Punters, for example, are certainly important, but most personnel executives would agree that they do not have the same impact as a franchise quarterback. This is the case defensively as well, and the positions that coaches typically prioritize are blue-chip pass rushers and elite cornerbacks. With passing attacks becoming more explosive by the minute, the number one goal for most defenses is to make life as difficult as possible for opposing quarterbacks. Generate consistent pressure, play blanket coverage, and even the best passing attacks will stall. Luckily, the Ducks are stacked at each of these premium positions in 2018. 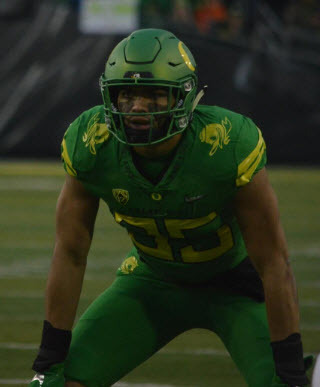 Defensive end Jalen Jelks is back after his breakout season to cement his place as one of the best pass rushers in the entire country. He is joined by another stud in edge defender Justin Hollins—an athletic marvel who would be the primary pass rusher on most other teams. 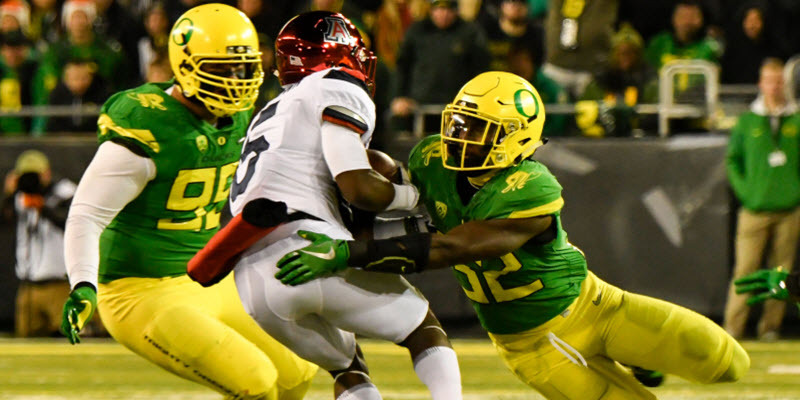 These two, joined by rising star Lamar Winston Jr. and others, should form one of the best pass rushing tandems that Oregon has seen in quite some time. The cornerback position also has a couple of players with star potential. 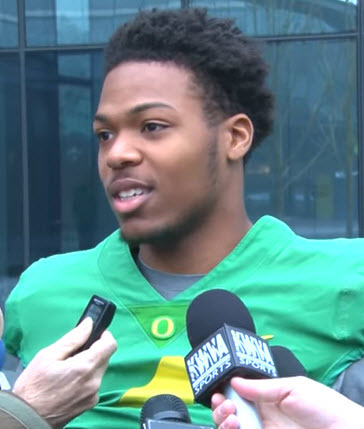 Most Duck fans who watched Thomas Graham Jr.’s growth this past season, and his shutdown performance in the 2018 spring game, would agree that he has the potential to be special. He’s got all the makings of a lockdown cornerback, as he demonstrated great ball skills, instincts and a competitive spirit this past season. Although he had his ups and downs, he now has a year under his belt, and I expect him to play up to his lofty potential. Thomas Graham Jr. has the potential be the next great Oregon cornerback. Lost in Graham Jr.’s hype is the fact that his running mate, Deommodore Lenoir, was actually the higher rated recruit coming out of high school. Lenoir is a future star in his own right. He’s got the physical makeup and the athletic ability to fill in perfectly alongside Graham Jr., and his progression this spring has been encouraging. He should see lots of action, with quarterbacks likely avoiding Graham Jr., so his abilities will be on display early and often. Now, having talented players is certainly important, but without high-level coaching, it is impossible to be a championship caliber unit. 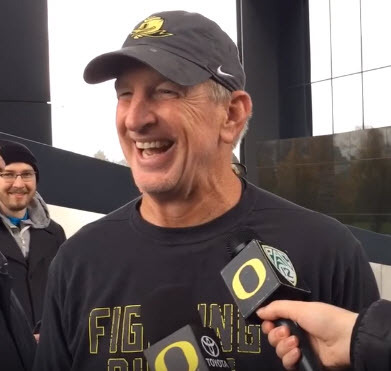 Luckily, we happen to have one of the best defensive coordinators in the business in Jim Leavitt. Leavitt brings a fiery spirit to the table each and every day, but more importantly, his enthusiasm resonates with the players, and it shows on the field. Look no further than how his defenses have fared before and after his arrival. He completely transformed Colorado’s defense during his time in Boulder, and he has already vastly improved an Oregon defense that was among the worst in college football just a few seasons ago. That is the face of a defensive genius. Folks, we’ve got a true gem on our hands and we are lucky to have him here for the foreseeable future. Leavitt has the chops to make our defense downright scary. Finally, look no further than the one link that has connected every dominant defense in recent memory: the superstar. Yes, the collective forces of teamwork, great coaching and talent at the premium positions are important, but without that one guy who gives the opposing offensive coordinator nightmares during game week, it’s difficult to be a truly transcendent group. From Tyrann Mathieu on LSU’s historic defense in 2011 to Richard Sherman on Seattle’s Legion of Boom, the top defenses at every level are built around special players who stand out, even among their own, talented teammates. Now, it is time for our very own Troy Dye to take center stage and assert himself as the next defensive superstar in college football. It’s Troy Dye’s time to be a superstar in 2018. Dye’s stats are impressive, but what can’t be quantified are the intangibles that he brings to the table. His leadership is infectious, his energy is unmatched, and his passion for the game is evident every time he steps onto the field. He may be the single most important player on our team, and I can guarantee that he will be the cause of a lot of long nights for PAC-12 offensive coaches. All in all, champions are often built on the defensive side of the ball. 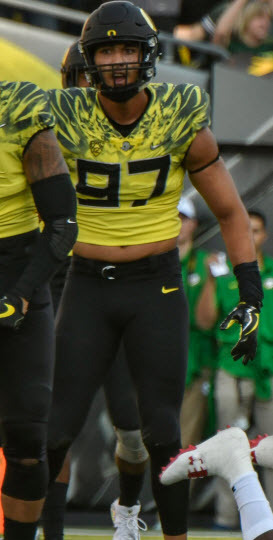 For years, talking heads discredited previous Oregon teams because of this belief, but now, it seems that everything is in place for us to have our best defensive season this decade. What do you think? Do you agree that our Ducks are in store for a defensive renaissance in 2018, or are my green-and-yellow glasses a bit foggy?